Menasha captures global award for its Pringles Tortilla Chip Launch at the annual POPAI Global Awards at GlobalShop 2016 in Las Vegas, Nevada; the promotional solutions leader also wins 13 OMA Awards. 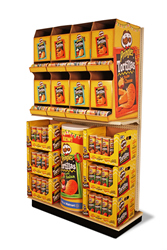 Menasha's 2016 POPAI global award winning Pringles Tortilla Chip Launch display. This is our industry’s highest achievement and we are so honored to be recognized among the best-of-the-best from around the world. Gold-winning displays from the 2015 POPAI competitions are eligible to receive a 2016 Global Award. This year’s Global Awards had 10 countries enter more than 50 displays. The winners were announced on March 23, 2016. The winners were announced on March 24, 2016 at POPAI’s OMA Awards Celebration during GlobalShop 2016. GlobalShop is the world’s largest annual trade show and conference dedicated to store design, visual merchandising and shopper marketing. This year’s OMA Awards had over 400 entries in 13 categories. Menasha Packaging Company, LLC, based in Neenah, Wisconsin, is a subsidiary of Menasha Corporation and has more than 3,300 employees at locations across North America. Also operating as Menasha Packaging Canada L.P. and commonly referred to as Menasha, the company is a leading provider of graphic consumer packaging, merchandising solutions, corrugated packaging, food packaging, shipping containers, material handling solutions, pack- out and fulfillment services. With a network of design, sales service centers, corrugated and paperboard manufacturing plants, and fulfillment facilities located throughout the United States and Canada, Menasha's mission is to help its customers protect, move and promote their products better than anyone else. For more information, visit http://www.menasha.com. Follow Menasha on Facebook, Twitter, YouTube and LinkedIn. Menasha Corporation is a leading corrugated and plastic packaging manufacturer and supply chain solutions provider specializing in retail merchandising packaging and displays, plastic reusable containers and pallets, protective packaging interiors, and packaging supply chain and fulfillment services. Menasha Corporation’s products and services are used by major food, beverage, consumer products, healthcare, pharmaceutical, industrial and automotive companies. Established in 1849, Menasha Corporation is one of America’s oldest privately held, family-owned manufacturing companies. Headquartered in Neenah, Wisconsin, the company employs approximately 5,200 employees in more than 80 facilities in North America, Europe and Asia. For more information, visit http://www.menashacorporation.com.